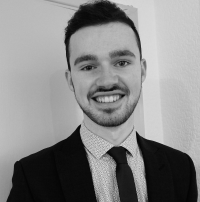 George started working for the team in 2016 as Murray's apprentice. His responsibilities within the company include the taking property photographs (essential when over 90% of prospective purchasers search on the web for a new home) and the writing of well-crafted sales particulars and the production of glossy brochures on prestigious properties. George also shows all perspective buyers around properties so is always out and about. George is a great asset to the team, he is always smiling and will go out of his way to help anyone. In his spare time George volunteers at a local charitable disco, he enjoys cooking and spending time with his family. Newton Fallowell Ashby is a Franchise owned and operated under license by Karen Clarke Estates Limited trading as Newton Fallowell, Registered in England Number: 05555603 Registered Office: The Point, Granite Way, Mountsorrel, Leicestershire LE12 7TZ. Karen Clarke Estates Limited is a Franchisee of Newton Fallowell Limited and not a subsidiary or sister company.. Karen Clarke Estates Ltd is a Franchisee of Newton Fallowell Ltd and not a subsidiary or sister company. VAT registration number 866033031.